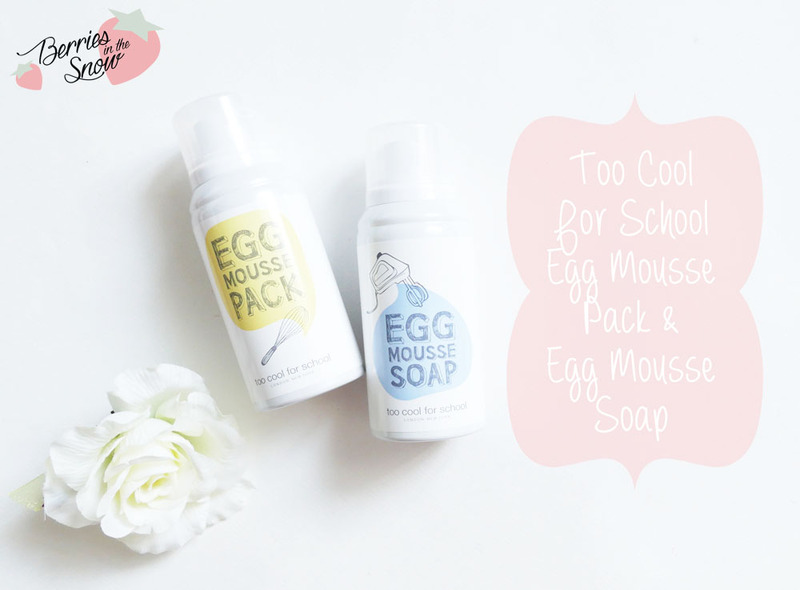 The Too Cool For School products I tried so far were mostly makeup products rather than skincare, but today I have reviewed the Too Cool For School Egg Mousse Pack and Soap for you. This special duo can be bought as a set or each of the two products can be purchased and used on their own. These two products help to improve the elasticity and the moisture of your skin with the nutrients from eggs. The design cosmetic brand Too Cool For School is a Korean brand, known for a unique packaging design. Their products are in the mid-pricey region and slightly more expansive than Etude House for example. The packaging design of the Too Cool For School products is always very creative and unique. I mentioned probably a thousand times how much I love their packaging design. 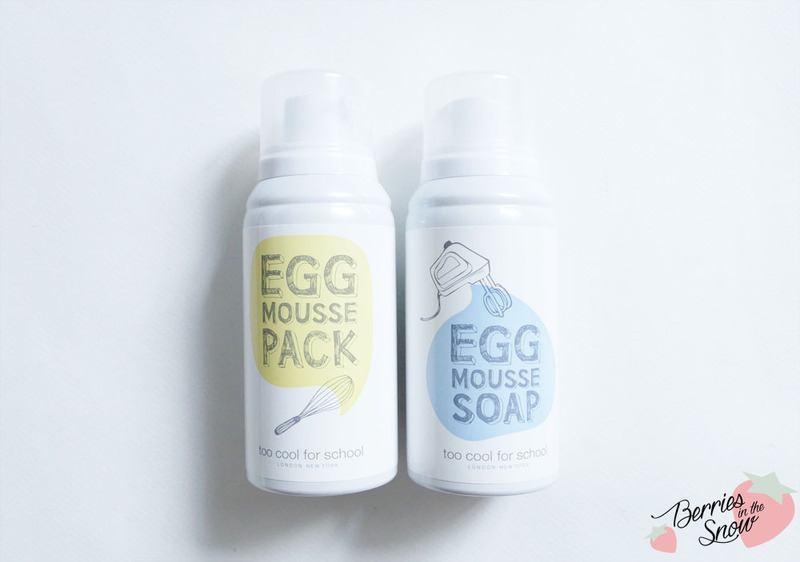 The Too Cool For School Egg Mousse Pack and Soap are no exception. This special duo comes wrapped up in a plastic bag and contains two pump bottles of 50 ml (Egg Mousse Pack) and 70 ml (Egg Mousse Soap). The pump bottles are mainly white, but have a cute doodle on the front showing mixing tools you usually use to beat eggs. The difference between the two products and the design of the bottles is obviously the color, which is yellow for the Egg Mousse Pack and blue for the Egg Mousse Soap. The pump is protected by a plastic cap and works like hair mousse products: You shake the bottle vigorously and push the pump. You will directly get a thick, foamy mousse product out of the bottle. 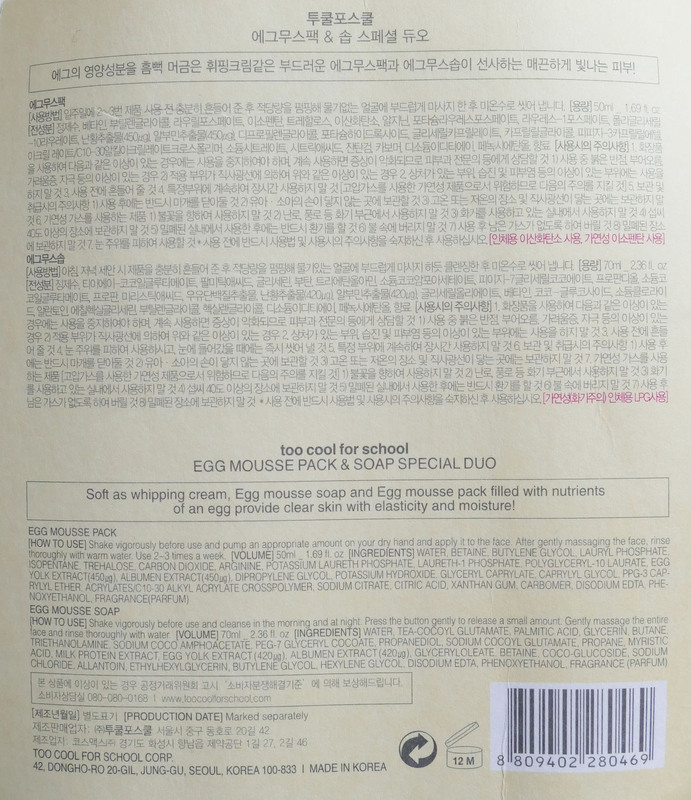 The backside of the Too Cool For School Egg Mousse Pack and Soap bottles contains description in Korean only, but the plastic bag contained a paper sheet with Korean and English description and ingredient list (click the image below to enlarge). 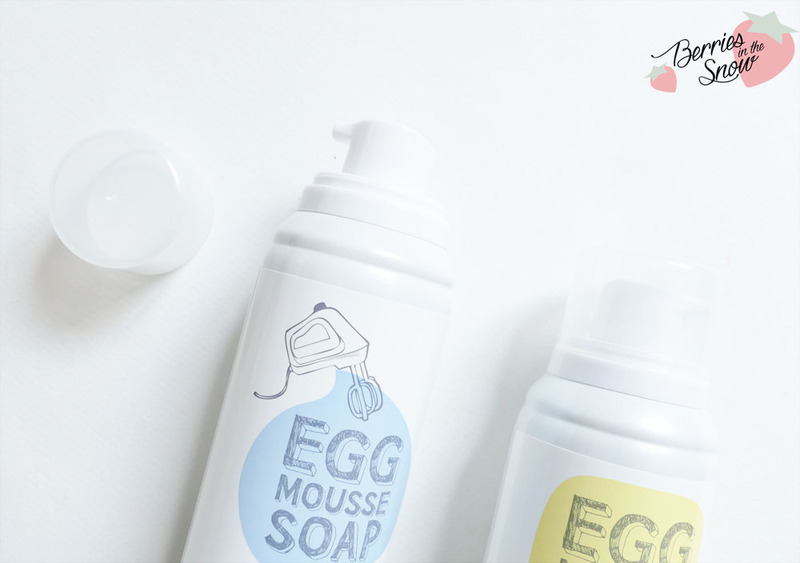 The ingredients are also listed on COSDNA and you can look the up >>here<< (Egg Mousse Pack) and >>here<< (Egg Mousse Soap). As the name says the key ingredient of both is egg or better egg yolk extract and albumen (egg white) extract. Albumen and yolk extract have moisturizing and conditioning properties for the skin and it is reported that egg white gives a temporarily relief to pores which leads to the appearance of tightened skin. The Too Cool for School Egg Mousse Pack and Soap contain each 450µg yolk extract and albumen extract, respectively 420 µg. The TCFS Egg Mousse Pack contains safe ingredients, but the Egg Mousse Soap contains two red labelled ingredients unfortunatelly: Triethanolamine and PEG-7 Glyceryl Cocoate. If you have very sensitive skin you might want to be careful in that case. The direction for both products is super easy! The Too Cool For School Egg Mousse Pack is a soft whipping cream massage pack. 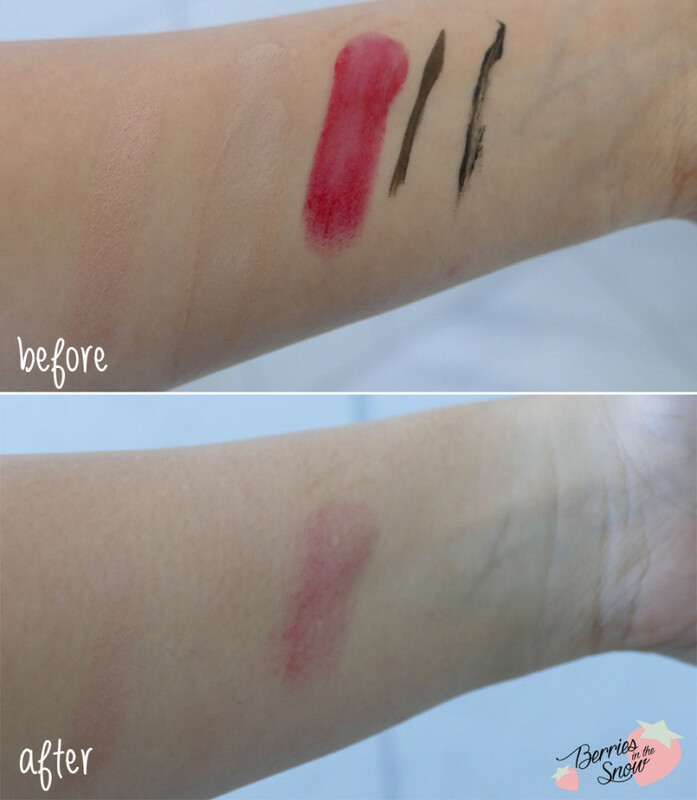 It is supposed to warm up while massaging and be great to use before applying makeup. It brightens and nourishes the skin with help of the egg yolk and albumen. It is advised to use this pack 2-3 times a week, by pumping an appropiate amount of the foam on your dry hands and massage it on your (also dry) face. After that you can rinse off the pack and voilá! The Too Cool For School Egg Mousse Soap on the other hand is a pore washing item. It creates a very dense and tight mousse which can be used for skin cleansing, but also as shaving foam for men. Again you can pump an appropiate amount of the foam on your hands and cleanse your face in the morning and evening. Afterwards rinse it off with water. Because you get both products as ready-to-go foam out of the bottle the application is very easy and straightforward. Both products are dense and soft foam, but the foam from the TCFS Egg Mousse Soap is stiffer than the one for the Egg Mousse pack. From the description I expected the Too Cool For School Egg Mousse pack to warm up while massaging, but the warming effect is not really as much as I expected. I was focussing very hard to feel it, if you know what I mean :D Nevertheless, the foam is very smooth and nice to apply. It has a fruity scent to it, which I didn’t expect. After washing it off my skin feels definitively tight, but soft. I didn’t see any differences in the size of my pores nevertheless. Although I expected the product to have a tightening effect I also have the feeling that my skin is drier, too, so if you have very dry skin I would not use the TCFS Egg Mousse Pack more than the advised 2-3 times a week. 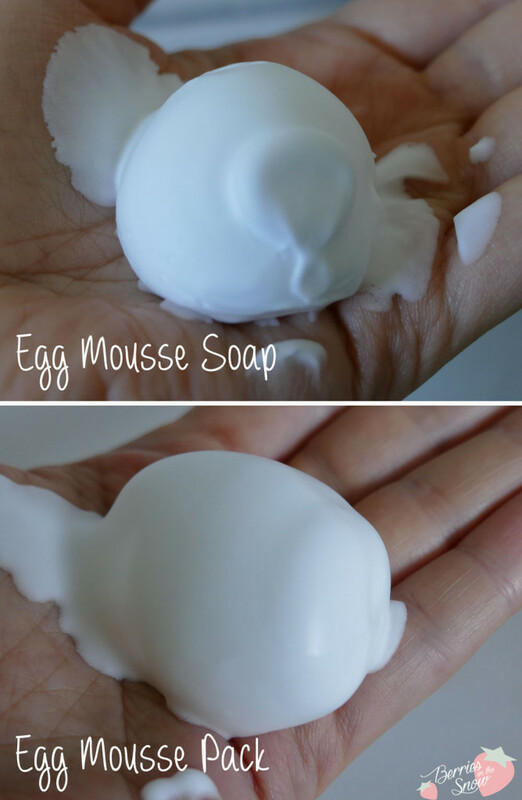 The Too Cool For School Egg Mousse Soap is a super easy and quickly useable foam cleanser. It has a pH around 6-7 (I’m sorry for those lovers of acid cleansers). In contrast to the Egg Mousse Pack the Egg Mousse Soap doesn’t have that extreme tightening effect but brightens up the complexion after use. The foam is super thick and stiff and it is really nice to work with. Unfortunatelly, the cleanser is not the most powerful one. In the picture below you can see that it doesn’t really clean off the eye crayon, lipstick and bb cream, and also for the eyeliner and mascara I had to wash it very thoroughly. If you are a double cleanser you will probably not mind the weakness of this foam cleanser. I wouldn’t advise you to use this foam cleanser as only step, unless you don’t use makeup/sunscreen. It is a good morning cleanser though, since you usually remove all the makeup in the evening and don’t use sunscreen during nights. Oh, and surprisingly, the TCFS Egg Mousse Soap doesn’t smell fruity, like the Egg Mousse Pack, but it has a soapy scent. It didn’t feel drying on my skin either, but made the skin feel soft instead. My conclusion for the Too Cool For School Egg Mousse Pack and Soap is a positive one. It has some negative points for sure: The weak cleansing power of the Egg Mousse Soap is definitively a con for this product, but I love the easy application and the feeling of the skin afterwards. The thickness of the foam is also great for those who love rich and dense foams. I also like the idea that it can be used as a shaving cream, so you can share it with your husband/boyfriend…The Egg Mousse Pack definitively gives me the tightening effect it promises, but it may be too drying for dry skintypes. Since it is not a daily pack I can live with that point. I wished the warming effect was more noticeable though. 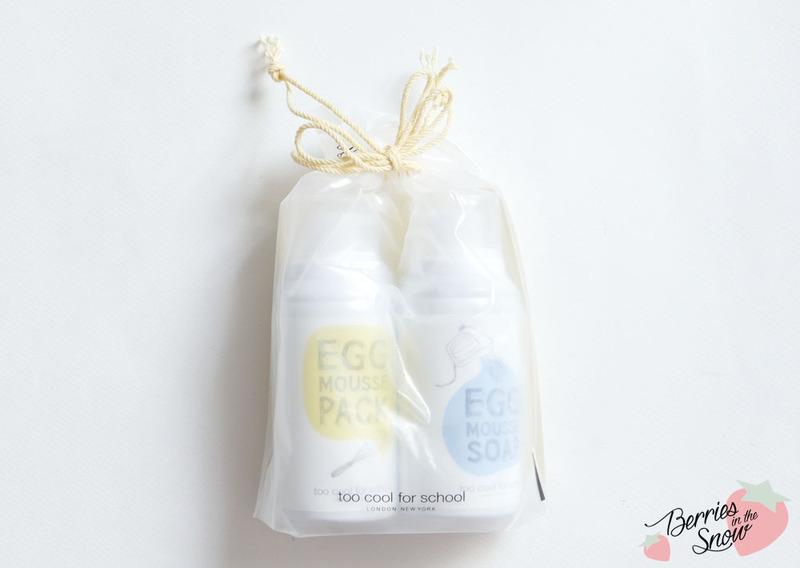 You can get the Too Cool For School Egg Mousse Pack and Soap Special Duo from the official Too Cool For School site. It retails for 18000 Won (18 US$) and contains the Egg Mousse Pack with 50 ml and the Egg Mousse Soap with 70 ml. If you buy the single products you will receive bottles of 100 ml (Egg Mousse Pack) and 150 ml (Egg Mousse Soap) volume, which retail around 12 US$. At W2Beauty the Special Duo retails for 27.85 US$. The large single bottles retail at testerkorea for around 10 US$ each. I like that this comes in a set, and it really is so cute , reading all of your reviews though it just seems so so. Excited for this months products! I got my box today! Kine last post…Fairy 1 Day Princess Brown Lens Review and Discount Code! Die Konsistenz bei beiden sieht ja super aus :) Aber für mich wären sie wohl eher nichts. Meine Haut ist schon sehr trocken und da brauche ich dann eher eine Foam, die auch noch Feuchtigkeit spendet. I love that they look like whipped egg whites! I love the quirky packaging! The egg mousse pack sounds amazing on tightening the pores, I wish they aren’t too dry.. But I know they are different hehehe.. The foam and the pack consistency on your pic make me wanna try them.. The mousse and the review both look great. So foamy….a shame the cleaning power isn’t great.